Adventures of a Dietitian | From food field trips to cooking courses, join me on a personal quest to find out what it takes to maintain a healthy lifestyle while eating good food. Hello everyone! 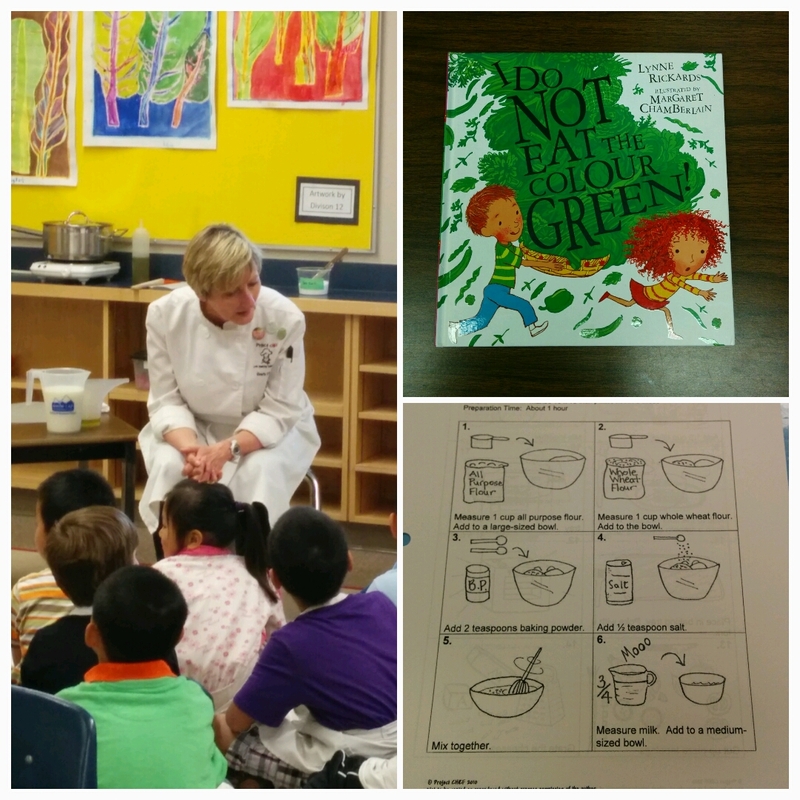 It’s been awhile since my last post (haven’t been travelling much lately) but I did have the amazing opportunity to check out a children’s cooking program while I was in Vancouver last month. 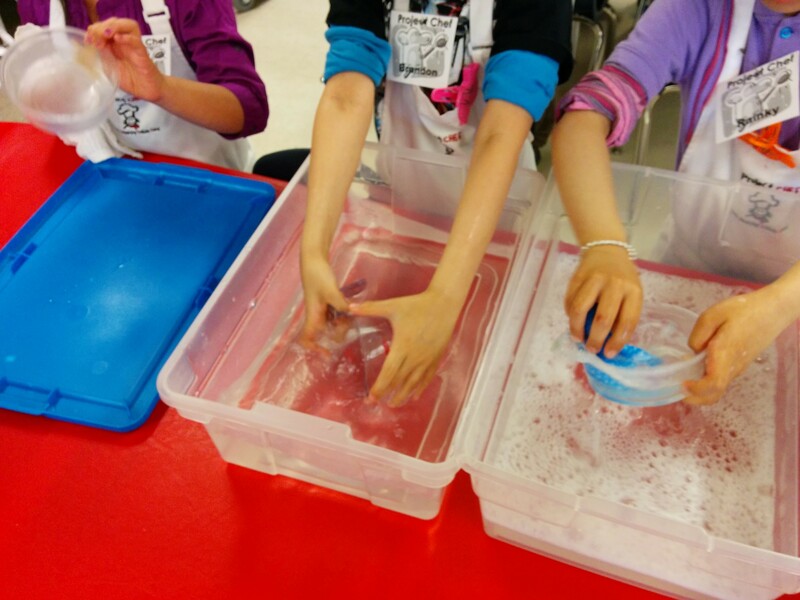 Project CHEF is a travelling cooking class where the director, Barb Finley, and her team of chefs visit school classrooms and teach cooking classes to elementary school children. The usual program runs for one week where a classroom of students take anywhere from three to five cooking classes throughout the course of the week. 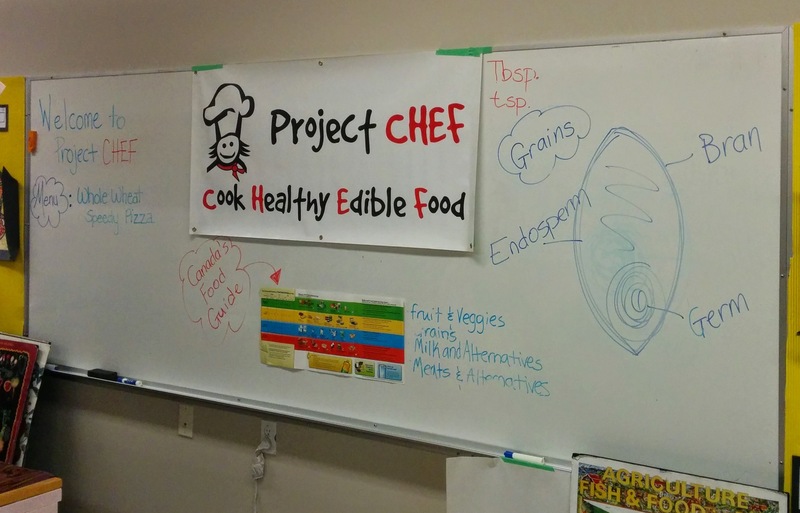 While I was in town, Project CHEF happened to be doing an in residence program – an extended version of their program where there entire school gets to participate in Project CHEF cooking classes. 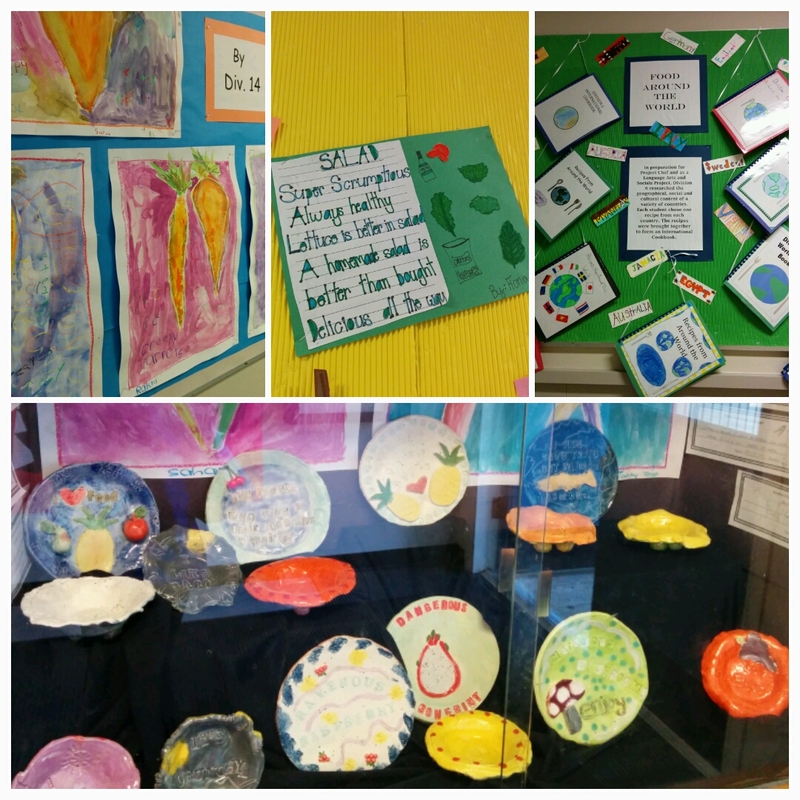 Classroom curriculum also ties into cooking and food at this time so art classes have students painting carrots and beets and bowls and plates are made in their pottery class. They even write about food for creative writing and put together a menu of different meals from various cultures for social studies. At the end of the residency program there is a big school wide celebration/assembly. Parent volunteers are welcome to help out during the 1.5 hour cooking class as well. 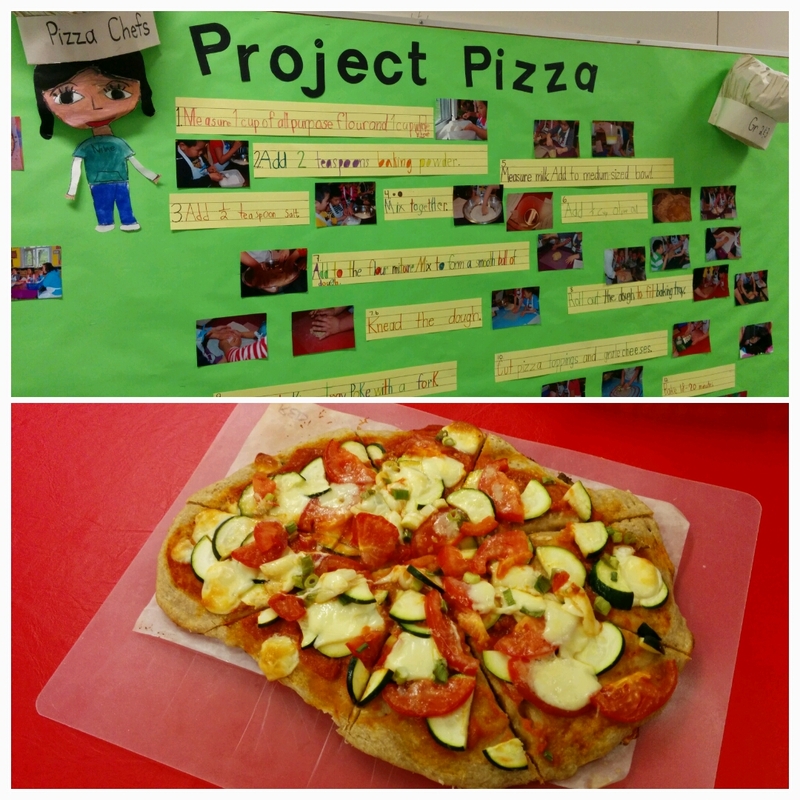 I helped out with a grade 1 class that made pizza and a grade 6 class that made pasta sauce. It was great to see each group of students working together to make a meal and learning various skills along the way. What makes this program unique is Chef Barb’s approach. She was a teacher before she went to culinary school and includes several teaching moments in the class to tie into other areas of curriculum such as math (how to divide a pizza into halves, quarters and eights), chemistry (how baking powder works) and what a vegetable is (an edible plant that doesn’t have seeds) versus a fruit. She also brings in visiting guests such as Ocean Wise, chocolatiers to talk about how chocolate is made from bean to bar and even Olympic athletes who talk about the importance of a healthy diet. And before everyone starts eating she encourages a student to volunteer how to say “enjoy” in another language (eg. bon appetite, kali orexi). She also provides table topics for the children to discuss while eating. And everyone is responsible for setting the table, doing the dishes and cleaning up! What’s truly impressive is that funding for the program is done through grants, foundations and private donations which Chef Barb applies for each year (the program has been running for 7 years with a number of other spin off projects that are currently underway). Right now, there are more schools who want to participate in the program than spots available (it’s the equivalent to a three year waiting list) so participating schools are chosen by a lottery. If you are interested in learning more about Project CHEF, you can find more information on their website. What do you get when you mix a croissant with a donut? A cronut! A friend of mine recently showed me a newspaper article about the cronut – a which a donut that has been made with laminated puffed pastry (a similar dough used to make croissants) and fried rather than baked (hence, the hybrid of the two pastries). I actually thought the whole thing was quite unnecessary as I’m a bit of a croissant purist. I even have a handful of bakeries that I go to just for their croissants because I really appreciate a good croissant (and finding one in Toronto can be tricky). The cronut was invented by an American pastry chef called Dominique Ansel who has a bakery in Manhattan (no surprise – I can’t imaging the French ever messing with croissants). What makes Chef Dominique Ansel’s cronuts unique (besides the fact that he’s trademarked the name) is that he uses a special mix of flour specifically designed for the cronuts so it’s not simple just taking croissant dough. This price tag for originality doesn’t come cheap though. The cronuts cost are sold for $5 a piece, that is a tall order for a breakfast bread and simple donut. 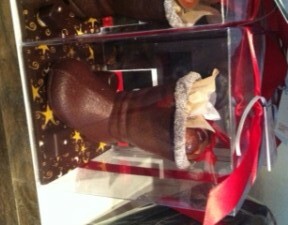 However, if you do want to try it, there is a bakery in Toronto that has it – Le Dolci. Or if you are planning a trip to New York City, the line up starts as early as 2 hours before opening in order to be sure you get a cronut. For more information about cronuts, visit the Dominique Ansel website. Or, if you can spare yourself the trip and try making them yourself. As much as I love helping out with the children’s cooking classes on Saturday mornings, I have to admit that Evergreen Brick Works isn’t located in the most accessible place. It’s located in the Don Valley where the Don Valley Parkway and Bayview intersect. It can be very tricky to find for first time visitors (I attribute this to being part of its charm but many would argue) and since it’s located a bit off the grid, the only way to access it is to either drive, bike, walk or rely on a very infrequent public transportation system that sends busses out every 30 minutes. I have been known to miss the bus on more than one occasion – including today. I decided that I’d better pick up a quick coffee and bite to eat before heading to Brick Works where I would be volunteering (entertaining kids no less) for the next two hours. I can be quite the coffee snob and although one of my favourite independent coffee shops (Broadview Espresso) is in the area, the last time I went there it took over 10 minutes for me to get my latte (and hence, missed the bus that time as well). I’m all about supporting independent enterprises but when I have a bus to catch I’m all about efficiency. This time, realizing that time was short, I decided to go to the McDonald’s around the corner for my morning snack. Yup, that’s right. I got called out on my McDonald’s. At first, I didn’t realize the reason behind the outburst. Is it because it’s corporate? Or branded? Or against the slow food movement? I later told this story to a fellow volunteer and she laughed saying “Don’t you realize where you are?” She then went on to tell me how there was a situation where someone brought a box of Tim Horton’s donuts to a potluck event and how people were making fun of it the entire evening. I guess there are better things to bring to a potluck (a farmer’s market potluck no less) but is it really that big a deal? 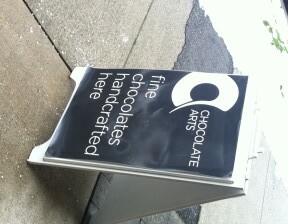 However, a little bit later I came across a sign that explained everything. Ah, I see! I’m pretty sure that McDonald’s is in violation of several of those statements: regional, seasonal, sustainable food production…family farms and artisanal businesses…fair prices, fair profits and fair treatment of workers….caring for the Earth. Whoops! I think the next time I’m running late, I’ll quickly down my coffee and eat my muffin on the bus and destroy all evidence before walking into Brick Works. I do shop at farmer’s markets in the summer when it’s superior quality and certain ingredients are in season that aren’t necessarily available in the larger grocery stores (zucchini blossoms come to mind). I also participate in the Good Food Box program through FoodShare where I get a box of fruits and vegetables delivered to me every other week. I’m all about buying from local, smaller establishments when the product is good and the price reasonable. 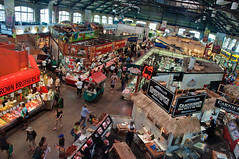 I even shop at St. Lawrence Market each week because of the variety and quality of products and the fact that I learn so much from the market vendors when I go there. However, my philosophy has always been that I will buy wherever there is good quality and service (whether it be from at the farmer’s market or the supermarket). 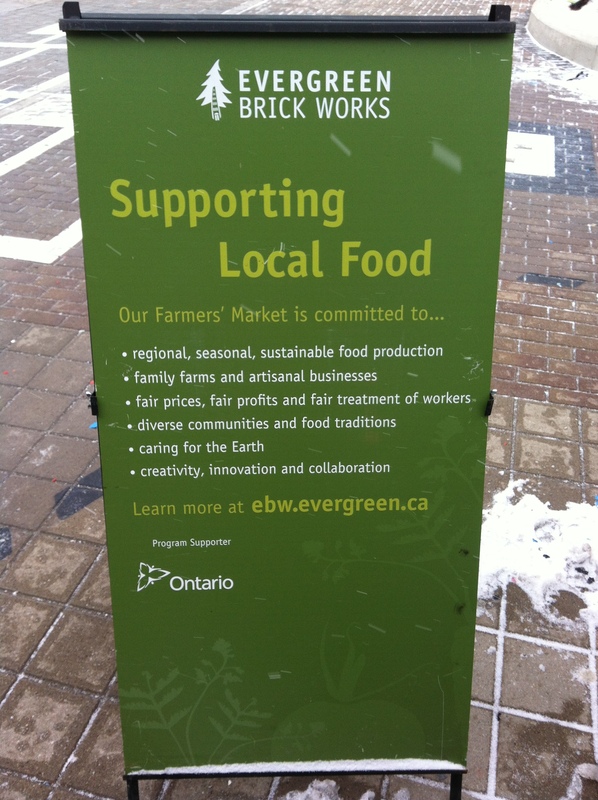 Brick Works definitely has a strong environmental mission so I can see it appealing to a certain audience – one that really wants to put their dollars toward saving planet earth and making responsible choices by choosing to buy from vendors who share the same values. But for me, it’s really hard to beat the McDonald’s coffee and muffin for $1.39 deal (especially when I have a bus to catch). After having experienced such a wonderful appreciation of food during my Paris trip, I felt compelled to get involved with food-related initiatives in Toronto. I investigated helping out at farmer’s markets, community kitchens and nutrition in schools programs with one goal in mind: To help get people more involved and appreciative of the food they eat. I really wanted to help out children since I believe that introducing cooking and healthy food behaviours early on can make a significant impact for when people become adults (one can hope). This led me to a volunteer opportunity with helping out at a children’s cooking class at Evergreen Brickworks. The program is called Growing Taste Buds where children ages 8-12 learn how to cook specific foods each week. This week was French cuisine where we taught the class how to make crepes from Julia Child’s cookbook “Mastering the Art of French Cooking”. Okay, it’s times like this when I can say that my cooking classes at George Brown are totally paying off. I just learned how to make crepes last semester during my French cuisine class! I still remember everything that my teacher taught me (i.e. the reason why you let the batter rest, the technique for tilting the pan so you get a nice round, thin crepe and how you can tell when the crepe is ready to flip onto the other side). It also helps that I analyzed and researched crepe recipes and technique ad nauseam for a homemade vs. store bought crepe taste test that I did. The kids took to making crepes like fish to water. In fact, at one point I had a system going on where I had each kid responsible for a specific task at the crepe station (one person greased the pan, one person poured the batter into the pan and one person tilted the pan and flipped the crepe) so I didn’t have to do anything. All I had to do was supervise! Haha! Kids at this age (8-12 years old) are capable of a lot. It kind of blows me away because I know a lot of adults who don’t know how to make crepes (and are actually a little intimidated by the thought) and here is a group of kids who are pretty much pros at it now! Next week we have a guest chef from Table 17 who is going to show everyone how to make homemade pasta. I am really looking forward to that! I found Sam James in the financial district! Today I was in much need of some inspiration so I decided to take a quick trip to one of my “happy places” in Toronto – First Canadian Place. I remember first stumbling across this mall that exists in the concourse and main levels of the Bank of Montreal (BMO) tower in downtown Toronto. Boasting a collection of stores that cater to the business crowd during the working day, it is one of my favourite places to window shop (and people watch). If you ever want to experience a real life fashion show, I suggest that you stop by this place on any given working day. Well, today I was in for a delightful surprise (which had nothing to do with the shopping). On my way to First Canadian Place, I saw a place called “SJCB” at the end of the tunnel that connects the St. Andrew subway station to First Canadian Place. The place is a simple coffee bar kiosk with espresso machines situated at each end of the counter. A simple chalkboard menu lists espresso based drinks and their prices on the wall. Can it be? Is this the elusive Sam James Coffee Bar in the financial district that I failed to find all these months? It’s been under my nose the entire time (well, since June when they opened). 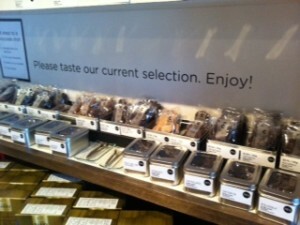 A small group of people were convening around the counter waiting for their perfectly pulled espressos. Even when I walked past it again, on my way back to catch the subway, there was still a group in front. This place seems to have a steady stream of people (ah, it’s so nice to know that Torontonians know a good espresso when they taste one). Of course I had to take the opportunity to order a latte. Although I didn’t have the good fortune to have my drink made by the man himself (it would probably be a rarity these days) it’s obvious that he did a good job training/hiring his staff. The espresso in my latte was smooth, without any bitter notes, and I didn’t have to add any sugar (my gold standard when it comes to a good latte). 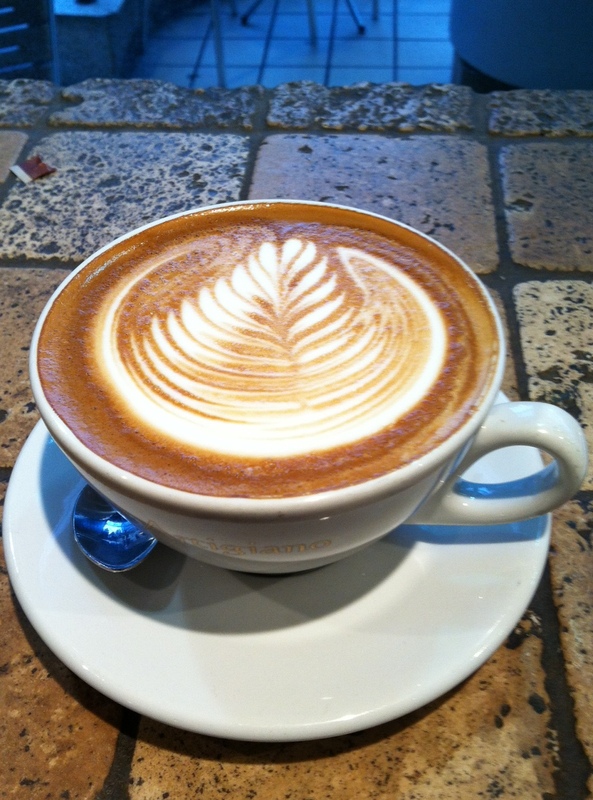 And the latte art was perfectly done as well (which is the norm at SJCB). Thank you Sam James! Way to bring great espresso to the financial district. It’s so nice to see a good independent coffee place make their way to the mainstream/commercial market. I find it to be a nice alternative to the indie/underground vibe at other great coffee places which are slightly off the grid. It’s nice to know that a perfectly pulled espresso is just a short subway ride away (in a shiny, bright building at the financial district). This little piggy went to the market…St. Lawrence Market! Last Thursday there was a food event called St. Lawrence Mmmarket Night that was held from 7-10pm. I am all about checking out the different food events that are happening in the city (Toronto Taste, Brickworks Picnic and Toronto Underground Market to name a few). This one caught my interest because it was being held at St. Lawrence Market and part of the proceeds were going toward FoodShare. I love shopping at this market. There is something about visiting the different booths that each specialize in something different that I find very comforting. 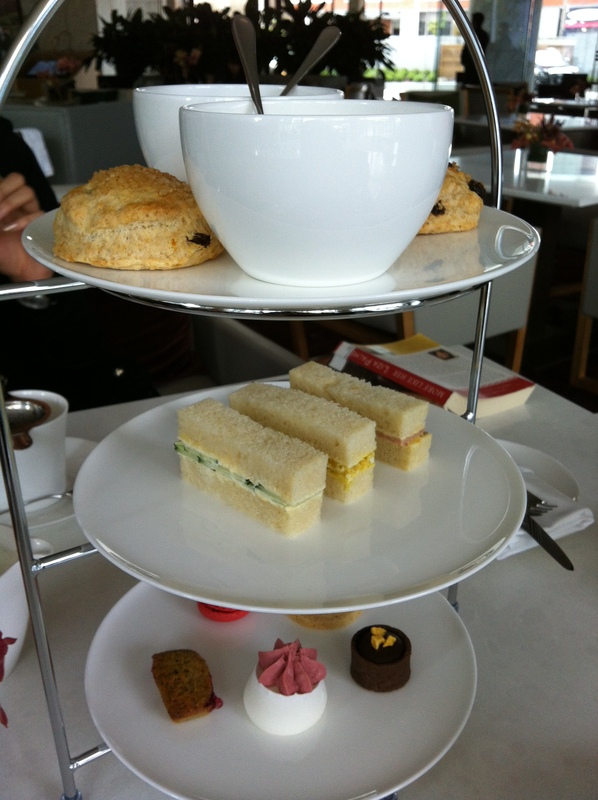 I love the variety and the fact that the prices are reasonable for what you get. The only thing that I don’t like about the market are the hours. It closes at 6pm most days and is closed on Sundays and Mondays which makes it difficult for me to visit on a regular basis. 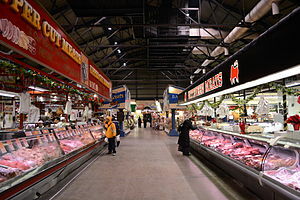 Saturday ends up being the most convenient day for me to visit but Saturdays at St. Lawrence Market can be a total zoo! (although I have heard that the 5am farmer’s market in the North market on Saturdays is definitely something worth checking out). 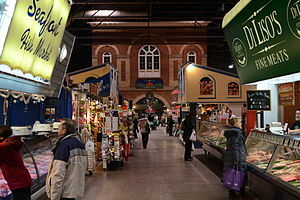 Just the fact that St. Lawrence market would be open late (past 7pm) was enough reason for me to go. I bought my ticket (and would later find out that the event would sell out). The cost of admission was $50 which included two drink tickets which made this event a total deal. I was worried that with events like this that the food would quickly run out. Not so! There was plenty of food to go around. I tried smoked trout, porchetta, pulled pork, French raclette, air dried beef, proscuitto, mussels, chicken and brie panini, codfish cakes, Portugese egg tarts, panna cotta, chocolate covered strawberries and champagne, pepperets, stuffed lamb shoulder, yam fries, pork ribs, chicken skewers, cheese fondue, fruit, duck breast, duck sausage, lamb sausage, crab cakes and duck burger. They were even cooking kangaroo! Mill Street brewery was also there serving up samples of their Cobblestone Stout. And this was all included in the $50! After about an hour in I wish that I had paced myself as I was at my limit and didn’t have any more room to try the crepes, speck, chicken cacciatore, saganaki, bagels, apple dumplings, roast chicken or kangaroo that they were also offering up. In fact, I had to start getting picky – really picky. I didn’t let myself eat anything that I had tried at the market at previous visits and I started avoiding breads entirely (I would just eat the fillings). Yes, this means I had to pass up the famous Peameal bacon sandwiches that were at Carousel Bakery and the famous veal sandwiches at Uno Mustachio (I’ve had them before and do enjoy them immensely on a much emptier stomach). This was such a great event. The $50 ticket sounded a little steep but the fact that it included two drinks and the event was all you can eat (and you got to learn more about the items that the vendors sell) made this event better than events like Rib Fest, Taste of the Danforth and the Food and Wine expo (where you still have to purchase drink and food tickets in addition). And you get to know your local food market purveyors and their specialty items! For me, that in itself was worth the cost of admission! I will definitely be going to this event (and visiting the vendors at St. Lawrence market more often). Now that I know there are places that sell porchetta, pork belly and smoked trout as well as shrimp and chicken rissois (definitely, the best find of the night for me), I’m going to try to make the St. Lawrence Market one of my regular food stops. 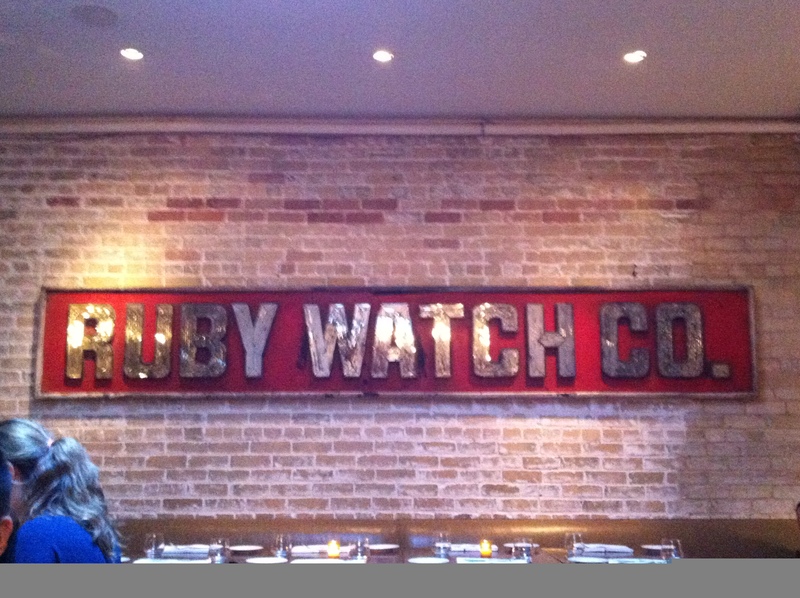 Birthday dinner at Ruby Watch Co. I usually plan something on the adventurous side for my birthday (kayaking, cycling around wine country, ziplining, etc) but this year I decided to relax and go to treat myself to a nice dinner at a restaurant that has been on my list for a long time – Ruby Watch Co. Most people know of this restaurant because it’s where you can find celebrity chef Lynn Crawford working in the kitchen. She is there most nights except when she is busy filming the show “Pitchin’ In” that airs on Food Network. 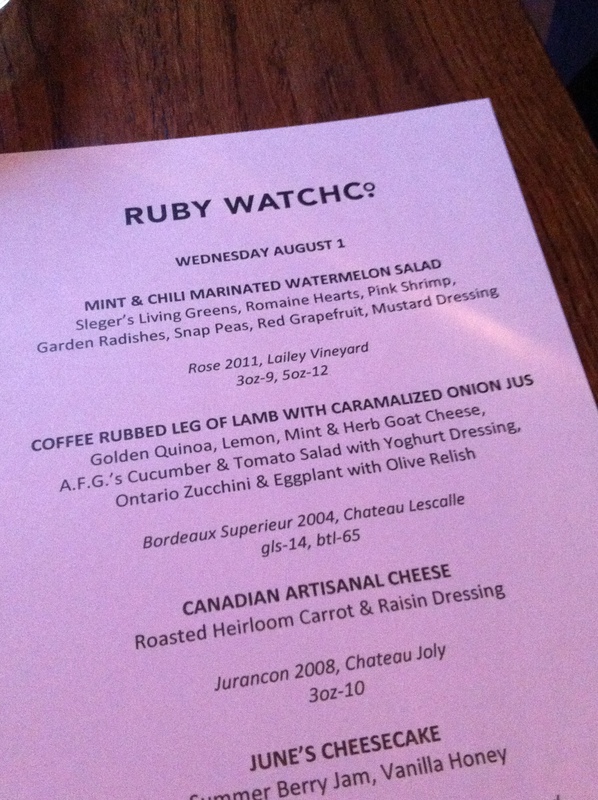 The interesting thing about the menu at Ruby Watch Co is that there really isn’t one. The menu is decided that week with each day offering something uniquely different. Courses are presented family style (love this) in the centre of the table where people can help themselves. The meal consists of 4 courses (one being a cheese plate) for $49 with suggested wine pairings for each course for an additional charge. I really love this concept. 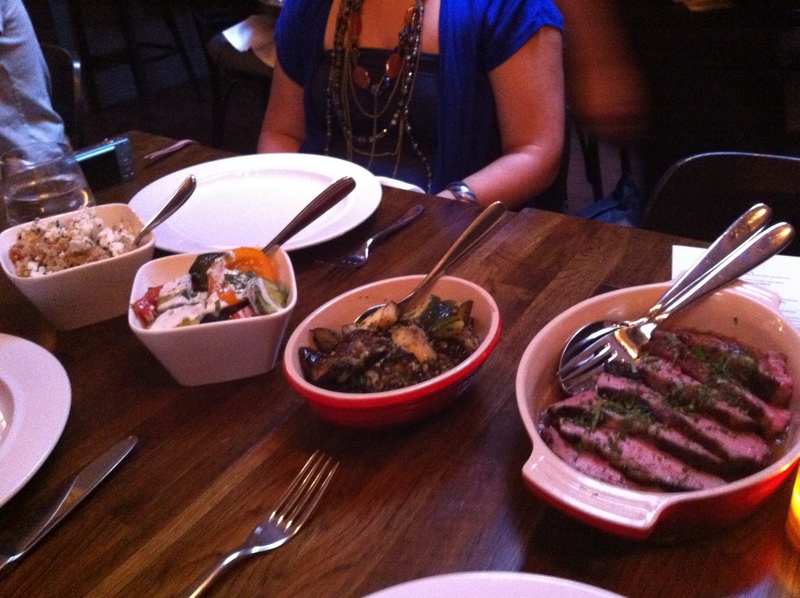 The vibe of the restaurant is fun and upscale but nowhere near feeling pretentious. The servers are wonderful with some being fun and entertaining characters which totally adds to the experience. 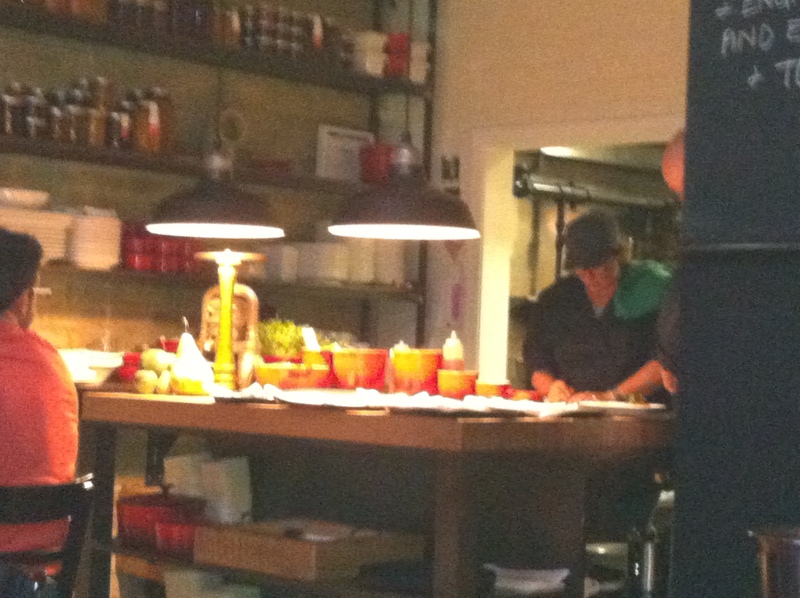 You can see Chef Lynn Crawford at the back putting the final touches on each dish as it’s being handed off to the servers. And get this, Chef Lynn Crawford tweets! Every so often she would take out her iPhone and type away. The group next to us tweeted to her during dinner and she even tweeted back to me between courses. Amazing! How often do you go to a restaurant where the chef tweets back to you while you’re having dinner? Our meal consisted of a mint and chili marinated watermelon salad, coffee rubbed leg of lamb with caramalized onion jus, a raw cow’s milk artisanal Canadian cheese and a blueberry cheesecake. The sides that went with the main dish (the lamb) were a quinoa salad with lemon, mint and herb goat cheese, a cucumber and tomato salad with yoghurt dressing and roasted zucchini and eggplant with olive relish. My friends and I never knew that cucumbers and eggplant could taste so good! I think I may have actually enjoyed the sides with all the wonderful fresh flavours more than the actual main which was lamb (and I love lamb). I never knew that quinoa and something as simple as a cucumber could taste so darn good! Chef Lynn really works her magic. I have to say that our waiter, Marty really stole the show. Such a great character, his over the top flair kept us entertained and laughing the entire evening. Ruby Watch Co isn’t a place that I would go for a weekly meal (I don’t quite have the disposable income to go there all the time) but if I want to have a great meal, be inspired and try something different (because the menu is always changing), this place is definitely on the top of my list. 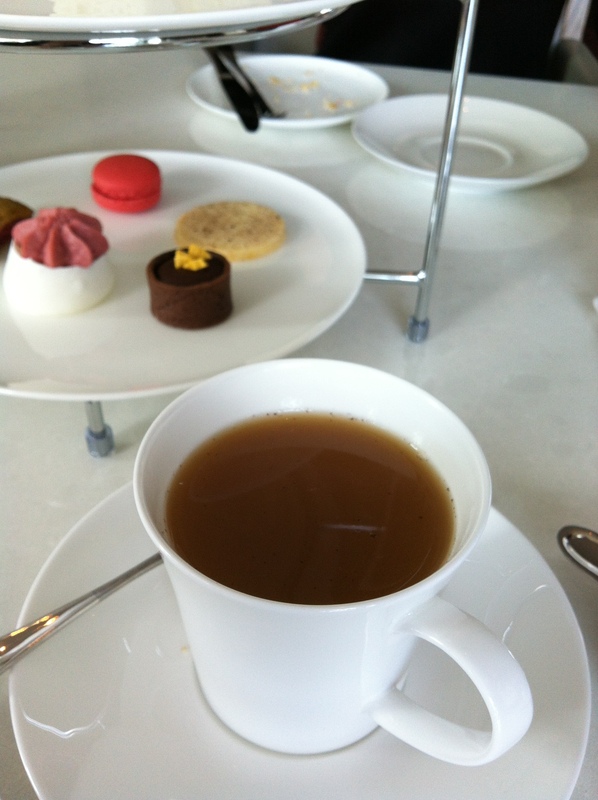 I really love the family style presentation and the wonderful service. I, for one, always found it a little hard to take a plate that is beautifully presented and have to make sure I manage to grab bits and pieces of every aspect to experience the combination of flavours. With family style, I don’t have to worry about that. Just dig in and enjoy! Bon Appetite! There are a number of beer events that take place in Toronto over the summer and with the heat we’ve been experiencing, it’s a great time for beer. There are a number of small/intimate beer garden events happening throughout the city. Both the Brewer’s Backyard (at Evergreen Brickwords) and The Stop’s Beer Garden (at Wychwood Barns) are beer gardens that are held on specific Sundays throughout the summer and fall. They feature an Ontario craft brewery each week so it’s a great way to try local beers and find out more information about them. There is no admission cost. You just buy tickets if you decide to have food or beer. 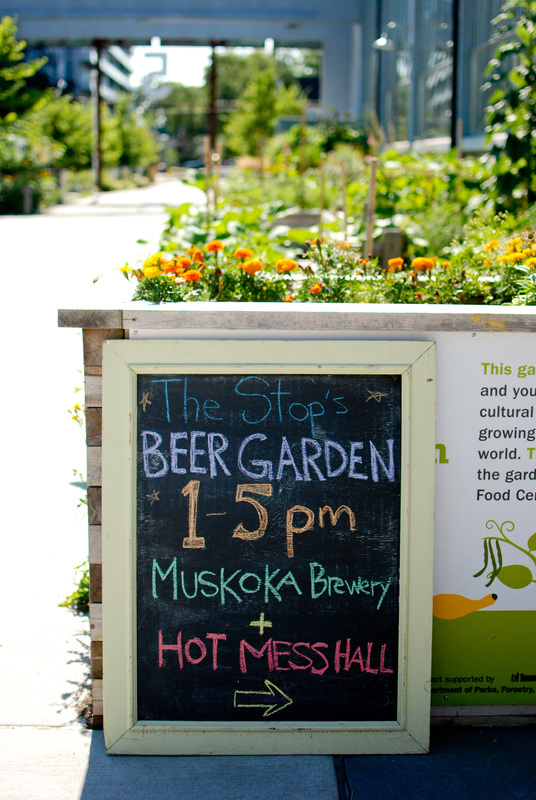 Last weekend the Stop’s Beer Garden was featuring Muskoka Brewery. I discovered their Summer Weiss beer last year and it immediately became one of my favourites. 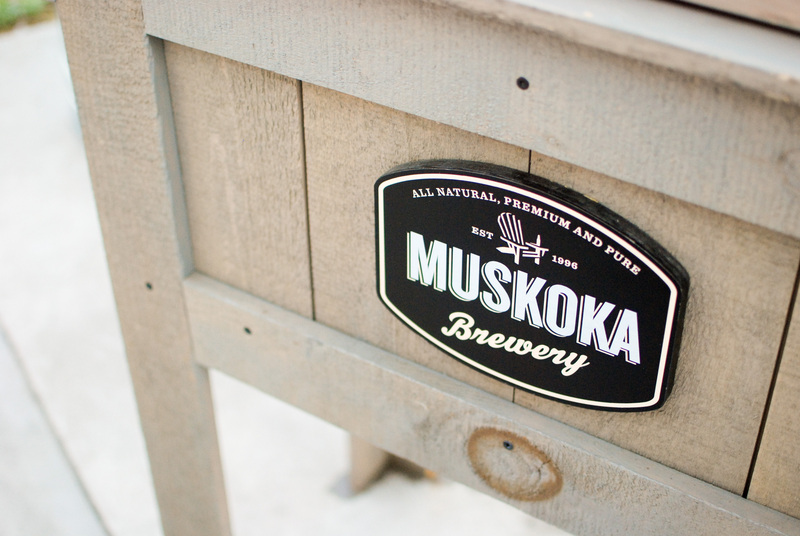 I was wondering what other types of beers Muskoka Brewery offers (and I have also had some difficulty finding Summer Weiss lately) so I decided to go to the event to find out more about the kinds of beers that Muskoka Brewery offers. At the the Stop’s Beer Garden they had a selection of three types of beer from Muskoka Brewery – Craft Lager, Cream Ale and Dark Ale for $5/473 mL can. These are three of the four beers that are offered year round (the fourth one being Mad Tom IPA). They also release seasonal beers each season which are available in 750 mL bottles at the Beer store (Spring Oddity, Summer Weiss, Harvest Ale and Dark Chocolate Cranberry Stout – can’t wait to try that last one which will be released in the winter). 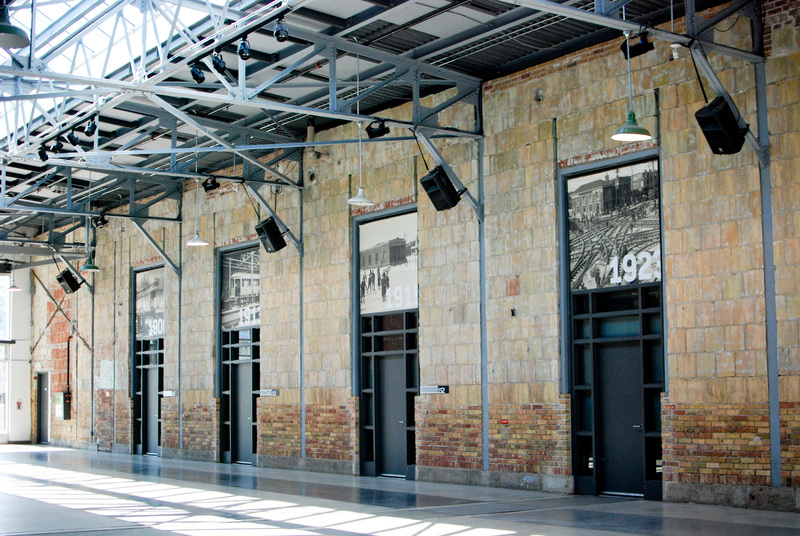 It was an intimate setting located at Wychwood Barns – a converted TTC streetcar garage that is now a greenhouse, community garden and artist studio/residence space. This is a great event to go to on a laid back afternoon for a nice cold beer in an open area on a lazy Sunday. And it’s also a great way to find out more about a specific brewery that you may be interested in. The people are nice and very knowledgeable. I will definitely be heading to my local beer store to get a 2 pack of Summer Weiss. Be sure to check out The Stop’s Beer Garden website which has a schedule of the local breweries that will be featured each week.